It’s amazing what you learn about your critical equipment when you get remote access to real-time performance data. In thousands of SiteSage installations at small commercial facilities – mostly chain convenience stores, restaurants, and retailers – we have seen the incredible challenge facilities maintenance people face every day when managing a distributed network of HVAC, refrigeration, lighting, cooking equipment, etc. There is always equipment under-performing, equipment going down. Even with regular maintenance programs, equipment can fail. It’s just entropy. We have shown that by providing facilities maintenance departments with real-time alerts and reports on critical equipment, we can help them more effectively manage this challenging array of equipment. We do this by informing them before equipment fails, and by illuminating why equipment has failed to enable a repair with a single truck-roll, not multiple. One of the bottlenecks in getting a failed piece of equipment back online quickly is the time it takes from when a problem is detected to when a technician is deployed to the site to repair the failure. This is where our recently-announced partnership with ServiceChannel comes into play. We can now link automated equipment failure alerts from SiteSage directly to the ServiceChannel CMMS system, which then automatically creates a work ticket for the equipment to be repaired. Overall, the combination of SiteSage and ServiceChannel can speed the time to resolving an equipment problem — both because the work ticket is automatically generated as soon as the problem is detected and because it now contains a far richer data set, enabling the technician to diagnose the problem much faster and with greater precision. We’ve recently integrated SiteSage with ServiceChannel at a large chain of convenience stores in the Southeast US. They are receiving SiteSage alerts from their walk-in refrigeration units, HVAC systems, and lighting automation systems, and automatically generating ServiceChannel work orders for repairs. While this particular customer may be a bit ahead of their peers in linking real-time equipment alerting to their work ticketing system, we see so many compelling benefits to this integration that we fully expect many other organizations to follow. 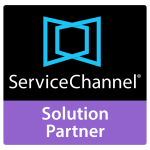 We look forward to growing our partnership with ServiceChannel and to having many more customers realize the operational benefits from systems that enable them to reduce critical equipment downtime. Jay Fiske spoke at the ServiceChannel CONNECT User Group September 11 & 12, 2017 in Las Vegas.